The only bad part about cooking at home is the dishes afterwards. 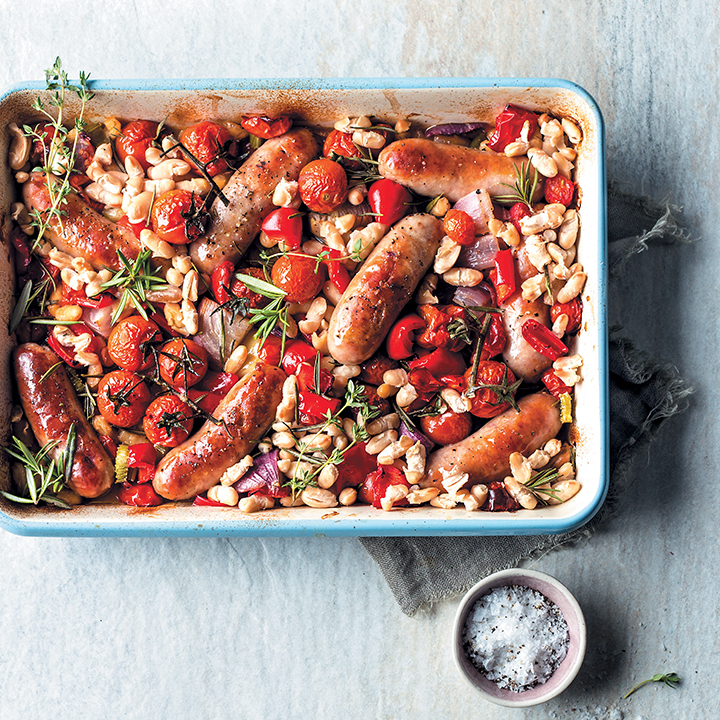 This pork banger and cannellini-bean bake is a one-tray dinner that minimises the washing up after cooking. Basically, all you need to do is gather the ingredients, put it in an oven dish and cook it for 45 minutes. It’s easy peasy lemon squeezy and it’s a dish the whole family will tuck into. Place the cut cherry tomatoes and stock in the bottom of an ovenproof dish. Top with the bangers, pepper, onion, celery, garlic and whole Rosa tomatoes. Sprinkle the rosemary leaves over and drizzle with olive oil. Roast in the preheated oven for 35 minutes. Add the beans and return to the oven, about 10 minutes. Remove from oven and serve.